FORT LAUDERDALE, Fla. — Florida is once again at the center of election controversy, but this year there are no hanging chads or butterfly ballots like in 2000. And no angry mobs in suits — at least not yet. 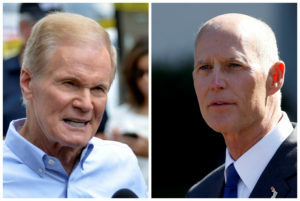 Florida’s Republican Governor Rick Scott and President Donald Trump on Friday alleged fraud without evidence, even as the often-laborious process of reviewing ballots in a close race continued ahead of the Saturday noon deadline. Broward County has a troubled election history. Its county’s election supervisor, Brenda Snipes, has been at the center of several controversies, including one 2016 case in which her office destroyed physical ballots but kept digital copies. A judge ruled that the law had been violated. While the Florida Department of Law Enforcement said there had been no allegations of fraud, Scott asked — but did not order — the agency to investigate the counties’ elections departments.